"MEET ME AT FISHER'S II"
Get yours while you can! They will not last long! Print Size: 15 1/4" X 26"
This Drive-In was located Springfield, Missouri at Sunshine and Glenstone in the late 50's and early 60's It was across the street from The Plaza Tower Theater. It was the second largest drive-in, in the state at that time. The ultimate place to cruise and hang out on a Friday and Saturday night. I used photos of cars from some of the actual patrons and used them in the painting. The original edition of 850 signed and numbered prints has SOLD OUT. 2nd Edition of 150 & 13 Artist Proofs available for purchase. 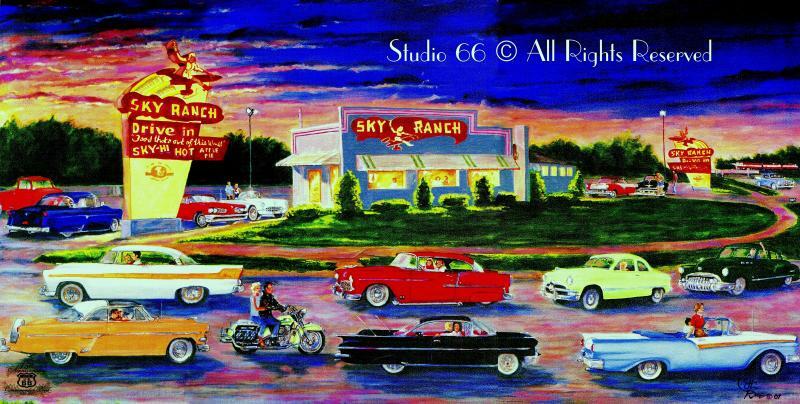 This is Sky Ranch Drive-In Restaurant in Springfield, MO on Route 66 at College & Kansas. It was a favorite hang out for the local young crowd during the late 50's to mid 70's. This edition is limited to 750 hand signed & numbered prints﻿. This scene was located on Route 66 in Strafford, Missouri. The Prints are available for purchase.